What are the “suggested edit stats” mentioned in the 10k tools page? (Emphasis mine.) What are the suggested edit stats? The Suggested edit stats has the list of all the approved/rejected/pending suggested edits of the period of day/week/month/all. Not the answer you're looking for? 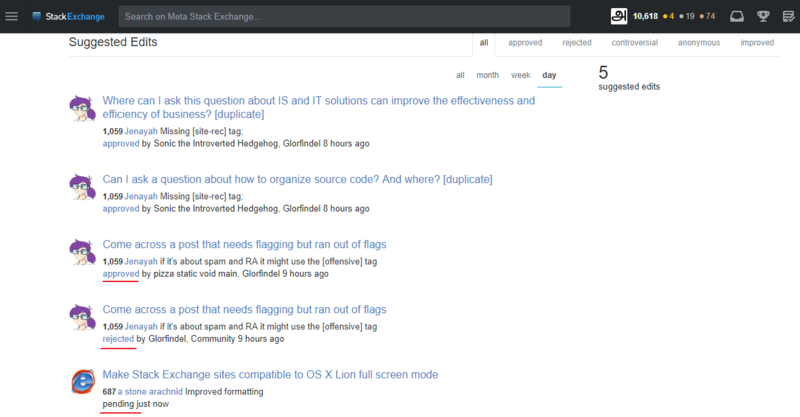 Browse other questions tagged support review suggested-edits 10k-tools tools . Is there a “how to” for the 10K moderator tools?